It seems so long ago now, and if you’d only turned up in the city in the last month you wouldn’t believe it, but Auckland has been having one of its wettest years ever. By September we’d already received more rain than we normally get in a year. Although I don’t think I got as wet this year as I have in previous years, I was certainly getting sick of constantly wet roads while riding my bike. Then, suddenly that completely reversed and we’ve had weeks of warm, dry weather. Perfect conditions for getting out on a bike, and the public seem to agree. 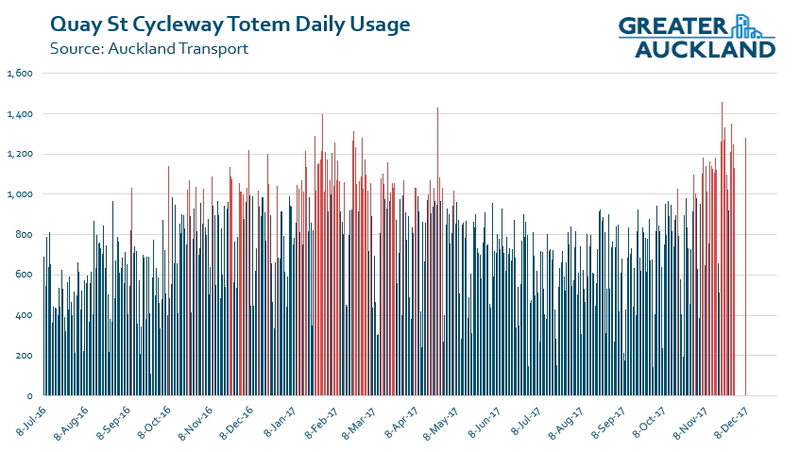 Every month Auckland Transport publish the results from their growing network of automated cycleway counters. There are now 37 automated counters on cycleways around the region, with most being in and around city centre, to help measure the impact of the investment being made. The most notable of these is on Quay St where a counter has been hooked up to a display showing how many bikes have rolled past. Throughout that wet winter/early spring the counters for most routes were showing modest growth, or at least the numbers were stable. That in itself was positive given the rain. However, the numbers show that since the weather settled there’s been an explosion of bike use. For many of our cycleways, November was the busiest single month ever recorded. Here are some of the results. As mentioned above, Quay St is perhaps our most visible counter due to it’s display that ticks over every time someone rides past. It is now one of our most popular cycleways. The graph below shows how many trips were made on each day with the days above 1,000 in red). November last year had just 7 days with over 1,000 trips recorded while this year had 3 times that with 21 days. 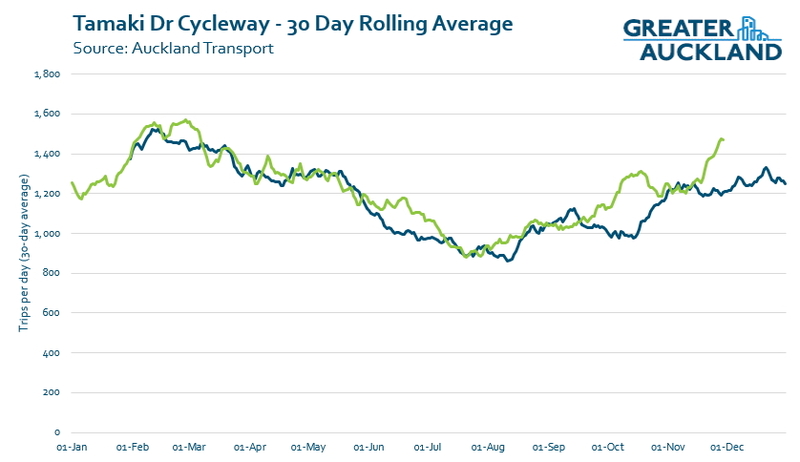 The Northwest Cycleway has seen some impressive growth in recent years as we’ve connected new cycleways to it. 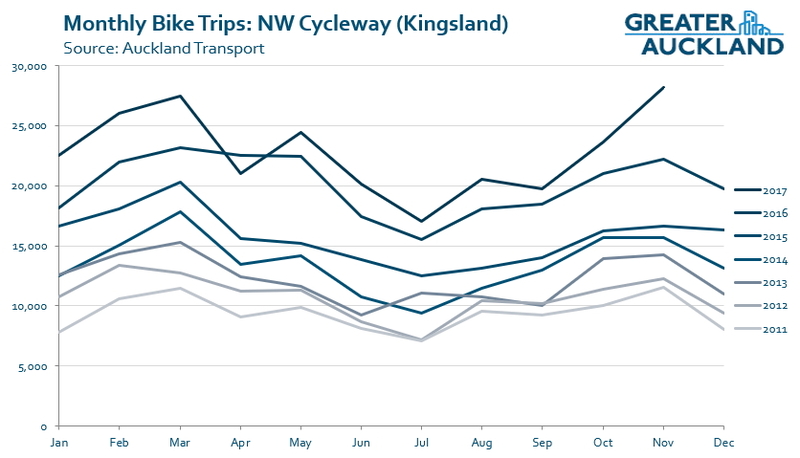 In November, more people used the cycleway at Kingsland than in any other month in its history. These are just a selection of the counters but there are similarly impressive results all over the place. They’re an ongoing confirmation that if we build safe, connected cycleways, that people will use them. With cycle numbers typically peaking in the summer months, if the numbers are as high as they are now, we could see some huge results in the coming months. Related to all of this, AT announced that due to the train strike last Friday, the counters recorded the strongest Friday ever in the city. Auckland’s city cycle counters have recorded their busiest Friday this year, with many routes seeing more than a 60 per cent increase. On Friday 8 December, 8787 cycle trips were recorded across cycle counters in the city centre and fringe, the highest count ever for a Friday. The average Friday city count for 2017 is 6,031 cycle trips. Kathryn King, Auckland Transport’s Walking, Cycling and Road Safety Manager says riders are making the most of great weather. She says people also took the opportunity to ride to work as an alternative to catching the train during Friday’s industrial action. “People looked for other options to travel to work, and more and more decided to ride their bikes. “Over 8500 bike trips in one day shows people are using their cars less for short distances and means public transport, freight, commercial vehicles and people who still need to drive can move around the network more quickly and easily,” Miss King says. “As we continue to connect our cycling network, people can now use lanes safely separated from vehicles. I wonder if some people the people who jumped on their bikes are about to start doing it more often. There are still some people in cars who see people on bikes as slowing them down. The other day I had an argument with a SUV passenger at the lights about my use of the advance stop box and their dangerous driving. What these stats show is a clear insight: drivers may perceive that bikes slow them down in some places, but these are micro delays of a few seconds at most. The macro takeaway is that thousands of people on bikes and tens of thousands on PT are the only thing that keep the roads functional at all. If these people took to cars the results would be permanent grid lock. It would be nice if more people – in particular funders – could see the forest rather than just the trees. You are courageous using the advance stop box. I’ve used them a half dozen times in the last 16-17 years in NZ, and have been meet with such near homocidal rage each time that I no longer do. Apparently it’s really important to car drivers to get to the next red light as quickly as possible. I’ve found the attitude getting better as more bikes are on the road, the average driver is getting used to bikes. There is always going to be exceptions to the rule. Yes, in general it’s getting better. There are pockets, though, where drivers are parking more in cyclelanes and driving more aggressively to make a political point. +1, I have noticed fewer and fewer instances of people not expecting bikes, but a lot more vehicular assault. I was riding home from work today and an Enviro Waste truck decided to teach me a lesson for “claiming the lane” by veering towards me and driving over the fog line as he passed me (no oncoming traffic). KP, I hope that you sent an email to the company. I noticed poor road behaviour by a Crockers Property Management employee today so I sent them an email. An invitation to a disciplinary meeting is often persuasive in changing behaviour. Good news all round. I wonder how much of an effect Onzo bikes had. I’ve seen a lot of people still using them this week, and I’d expect most of those riders wouldn’t normally cycle. I think it someone that doesn’t normally cycle used one of those single gear Onzo bikes they might never ride a bike again. My flatmate had her first bike ride for many years using onzo on a whim last week, and is now keen to get her own wheels. Looks like I am not a good judge of new cyclists, and incorrectly assume my prejudice towards bikes without gears is shared by others! There is a several whole biking subcultures dedicated to bikes without gears. SS (Single speed), Fixie (Single speed, No freewheel), and BMX (single speed, smaller frame & wheels to suit tight track racing, and freestyle tricks). I’m impressed at how often I see them at bus stops in the suburbs. This amazing weather has been great. I’m a fair-weather cyclist and won’t cycle even if there is a rumour of rain. So I’ve cycled to work most days in Nov/Dec and it’s been great. I’m not surprised at all that more cyclists are doing the same as the cycle network slowly becomes more connected instead of piecemeal. I think there is lots of latent demand and if they build a safe network, more people will join in. The only problem is that the cycle network will soon start getting congested too. It’s starting to happen in places, with queues for crossings at Quay St. and Beach Rd, and some of the traffic island at the bottom of Grafton Gully at Alten Rd is occasionally full of bikes waiting to cross. I think today is going to be huge. There were 121 rides recorded on Quay Street at 6.45am and almost 300 by 8am. Highest I have ever seen at those times. Perhaps I’m reading the above graphs wrong but I’m not seeing explosive bike demand. Comparing December 2017 with December 2016 us plain silly as weather conditions impacted ride numbers in 2016. The Tamaki Drive numbers appear to be down on the comparable fine period of February 2017. Quay Street the same with slight growth coming from the North Western cycleway. Overall the numbers show there has been no growth in anything except the self-importance of the cycling community. Reading 10 whingy cyclists in the comments section is enough to make any driver want to buzz a cyclist. If cyclists want respect from other road users they need to start showing respect. Observation of road rules would be a good start and learning how to share wouldn’t go astray either. Yes, being considerate of other road users is important to keep the SUV drivers happy, but your attitude sure says a lot. The enormous majority of motorists speed every single time they drive. If we are going to talk about observing road rules let us at least target the group that are killing people. Yes, “enough to make any driver want to buzz a cyclist”. Any driver, huh? Especially one with anti-cyclist sentiments. It’s so fun sharing the road with drivers who make threats like this one. Buzzing kills. Does a comment that translates to ‘shut up about vehicular assaults or I’ll kill you’ breach user guidelines? +1 Of course it does. TRM is usually helpful because his comments assist us to be prepared with answers for others of the same mindset. But calls to violence like this go too far.